Light, refreshing and an easy party drink, Sangria is a perfect way to entertain people. But is it just for the summers? Nope. 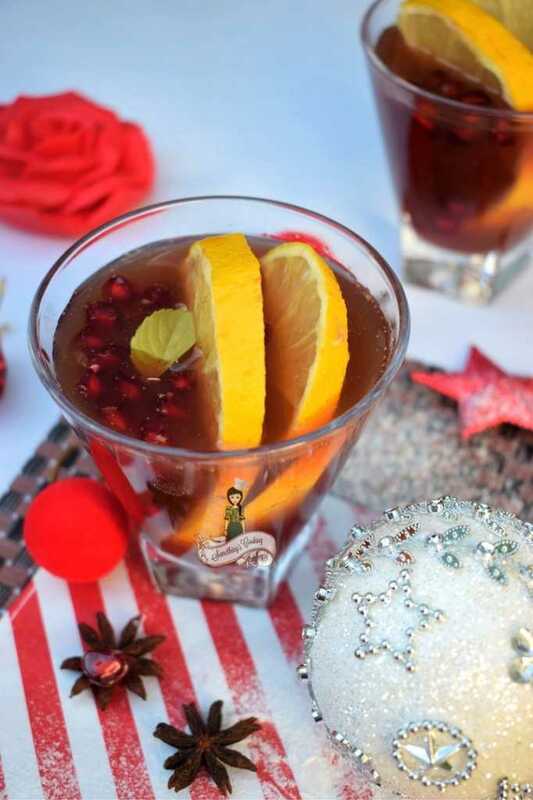 Winter Sangria can become a quintessential part of the season if you prepare it with a few twists. Sangria is an easy to prepare, easy on the pocket fresh fruit wine cocktail. It has its origin from Spain and uses red wine, seasonal fruits, bubbly water or soda. The club soda is optional but I guess, that’s the refreshing twist to this drink. It lightens the drink as well. 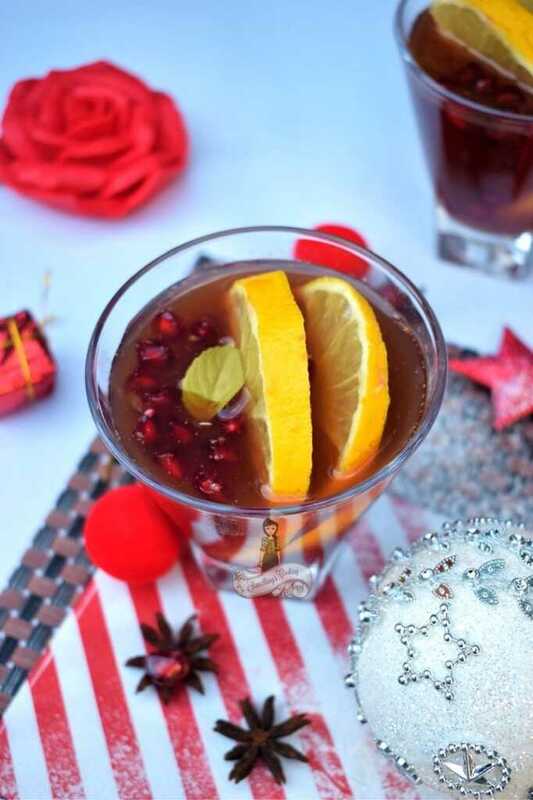 Incredibly versatile, include winter elements like pomegranates, pears, citrus, and apples in a Sangria for the winter version. Look at the color? Doesn’t it feel fancy and festive? That’s the purpose as well. Ease into the New Year with this cocktail in hand. 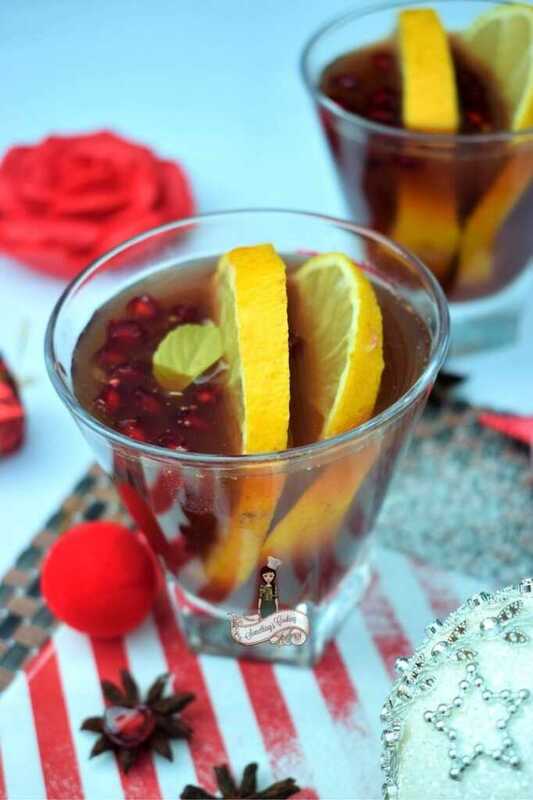 Belly-warming, comforting and just the right mix for chilly winter evenings, this Winter Sangria is sort of my escape from this cold. Ah! The kitchen smells wonderful as I whip together this punch. There are so many variations of sangria, but the base is the same. It’s best made a few hours before the party or dinner, as it helps to mellow the flavors. The key to making Winter Sangria is making a mulled-spice syrup. For this, you need to simmer cloves, star anise, cinnamon, orange rinds, sugar, and water for about ten minutes. Let it cool. In a pitcher, combine orange juice, red wine, and fruits. Top it with club soda and pour into each glass for serving. If you are preparing it ahead of time, add the fruits and club soda only just before serving. Also, you can add additional alcohol like brandy or even ginger ale. As I said, there isn’t really a “wrong” ingredient here. 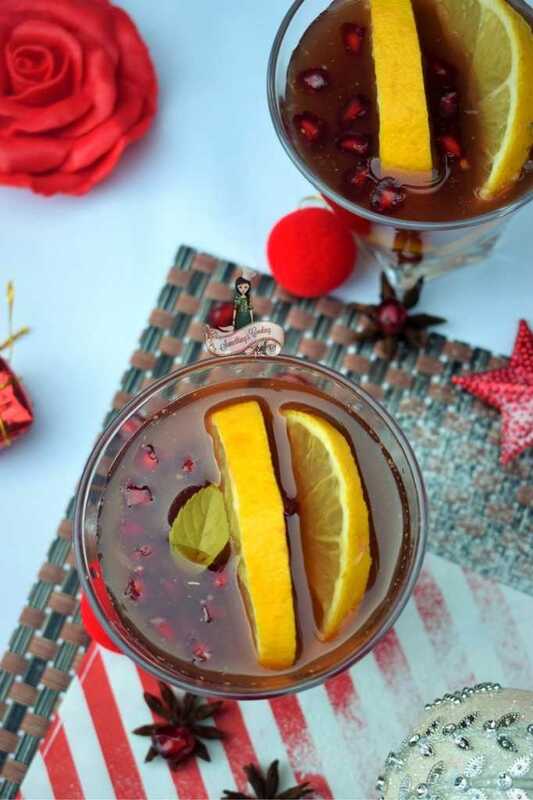 A refreshing Sangria cocktail with winter flavors and spices like cinnamon, cloves and star anise. In a saucepan, add the ingredients for the simple syrup. Bring to a boil and let it simmer for about 10 minutes. Remove from heat and let it cool. Strain and discard the solids. To make the sangria, combine the orange juice, simple syrup and red wine in a pitcher and top with club soda. Pour into glasses and garnish with fruit and rosemary/mint sprigs before serving. You can keep the simple syrup refrigerated for up to two weeks. Isn’t it amazing? Don’t forget to pin and save it for later. Oh, better yet. Why don’t you try it out tonight and let me know how it turned out for you? Wishing you all a very happy and blessed 2018. 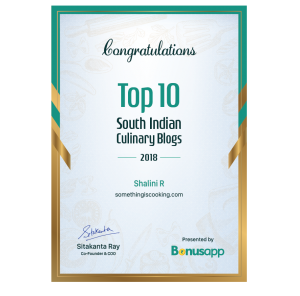 This is such a lovely recipe Shalini! I can almost smell the aroma and taste the burst of flavor as one takes a sip of this delightful cocktail. Sheesh I have only white wine left over after all the new year partying, will it work? Oh this is a favin my home for summers and winters! 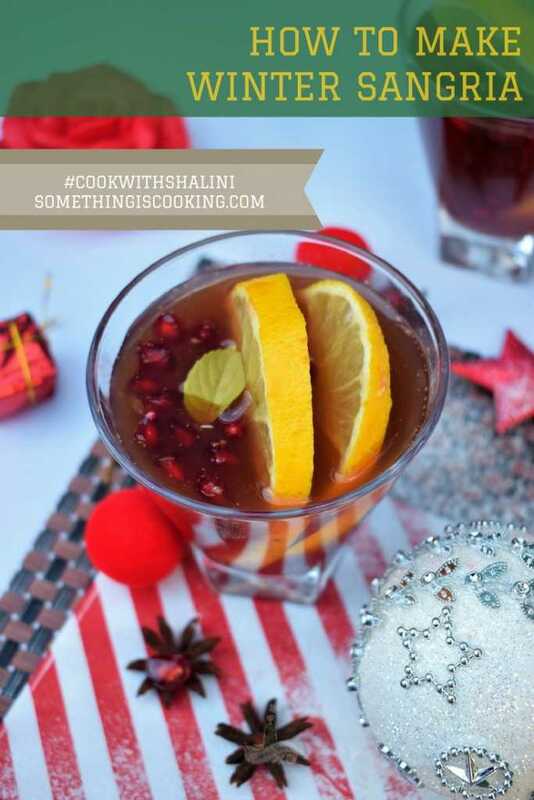 In winters I spice it up and warm the wine to make a mulled one; its a big hit with my friends! Wish you a very happy new year Shalzz!! I loveeeeeeeeeee red wine sangria and can drink a pitcher all by myself. I’ve never thought of making it at home till date but now I will. Sounds simple and delicious. And the fruits look fresh and inviting.